Grilling great July 4th meals when we’re home has become no problem for me on my low-salt, low-fat, low-sugar diet. I simply turn to fish, like wonderfully delicious salmon, or white meat chicken with rosemary and other spices. A July 4th salad with romaine lettuce, tomatoes, low-salt olives, fat-free feta, mushrooms and salmon. But eating away from home on the 4th has become an annual day of fasting for me because other people make the traditional 4th items of hot dogs, hamburgers, ribs and other delicious foods I can no longer eat. I wrote Fourth of July: why I went hungry while the country celebrated in 2013 after a particularly frustrating day at a 4th of July party where there was absolutely zero things I could eat. Last year we stayed home and I ate on the 4th but this year we were invited to a party we simply could not pass up, a wonderful friend’s retirement party. So rather than face another holiday without food, I decided to bring my own food this time, a course I’d recommend you follow as well when you know you’re going to someone’s house where your food needs won’t be top-of-mind when menus are planned. The first thing I did was buy a whole watermelon to take. I could eat at least half of it, if that was my only alternative, so already I was ahead of my last starving 4th. 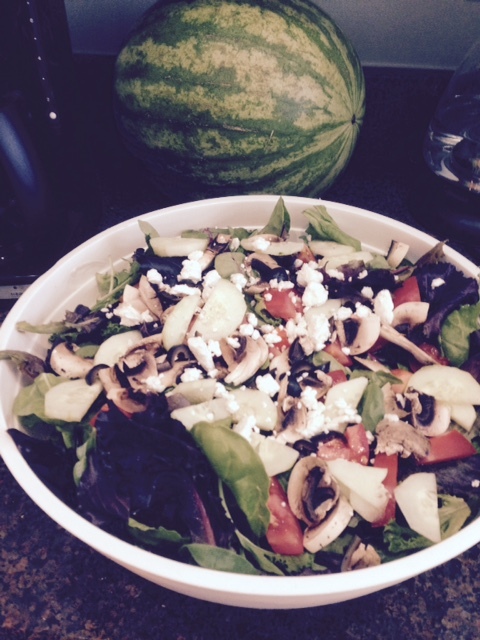 But then I also made a mega-salad to bring, using four heads of romaine lettuce, adding mushrooms, fat-free feta cheese, low-salt olives and tomatoes. I topped it all with pieces of salmon I had cooked with olive oil. As it turned out, our hosts had a fruit platter, so my watermelon never got cut, but that was fine with me, I left it behind as a party gift and enjoyed the fruit that was available. The main dish at the party was Sloppy Joes, which I can’t eat, given the fat in the beef and salt in the Sloppy Joe sauce and buns, so I was more than happy I had my salad. And I think others enjoyed my salad too, it was mostly gone when we left. So, when in doubt, bring your own food, and be ready to share it too, others might thank you for it. (Also, I made myself salmon when we got home).